Here is a portrait of me that I drew May 15, 1976. I had left Synanon, a rehabilitation community, six months earlier and was living in East Oakland, California with a small group of artists and students. In drawing this image with a magic marker, I was not aware of any issue regarding the trauma of my infant surgery. I was drawing because I felt depressed and hoped for relief and clarity. What’s clear though is my inner knowledge of my pyloric stenosis surgery. The left side of my face is basically intact. The right side, however, is completely absent of facial features! Depicted instead is a series of sharp edges. The obvious one in the center is a meat cleaver and resembles exactly, hole in the blade and all, a knife that I used to juggle in my early teens. My mother went back to work when I was eleven years old, and so often after school I was alone in the house. At that time, I engaged in some risky behaviors. I would take out the meat cleaver and a huge steak knife and juggle them. I wasn’t very good at it and once, believe it or not, I actually stuck my knee out to break the fall of the cleaver so I wouldn’t scar my mother’s kitchen linoleum. My body wasn’t real to me, in many ways; my feelings had hardened toward it and so, it was like an object. The black mark below the cleaver on my face looks somewhat like a disposable razor and the shape above reminds me of a barber’s straight razor. In any case, all the images have sharp edges and are black. Something was excised. Something was missing. Something was troubling me of which I was unaware. This portrait is an example of the power of visual art: We know things that we don’t know that we know. 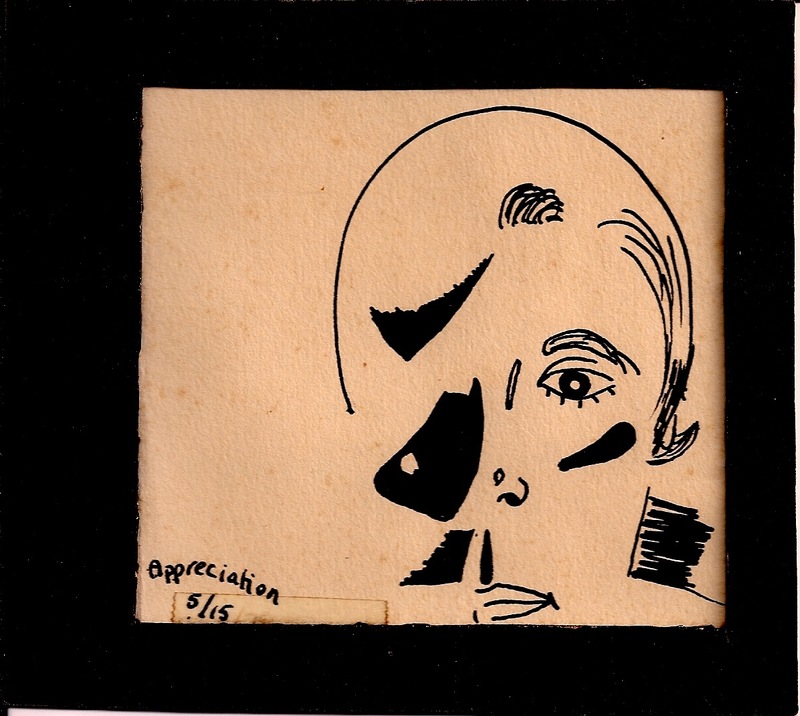 Interestingly, I titled the piece “Appreciation.” At the time, I was trying to validate myself. When this image arrived on the page, I felt mixed feelings. While I liked the depiction of the left side of my face in which I am focused, insightful, and authentic–not smiling, trying to please–the right side bothered me. I eventually attributed the black spaces and absence of facial features to mean that I was still unaware of myself in many ways. I felt a bit of compassion for myself. Though I did not understand what my subconscious was getting at. I did not see the sharp edges in the portrait when I was 23. Now I see the blades clearly and the message they were trying to convey: Your infant surgery–go back to what was cut away. Explore it and integrate what you find. It’s essential to becoming a whole portrait and leaving depression behind. Fill in those excised spaces with your story. Not the story that was told to you, the one that you adopted–your parents’ words, your pediatrician’s words–but your version, your truth. Then, you’ll be able to face yourself. Hi Ellen. Thanks for your comment! The photo is a picture of horseshoe crabs. See my post “Why Horseshoe Crabs?” — my first post ever almost three years ago. It explains my connection to the crabs and the reason that I was starting my blog. (Just put the title of the post in the SEARCH box above and it should come up.) I love writing about the past. Each time I go back, I see it with new eyes. Sometimes though I write about the past because I can’t seem to go forward until I do. Right now I’m showing how my artwork revealed my early trauma when my conscious mind (my memory expressed verbally) couldn’t. Wendy, I love these posts that feature your artwork with self-reflection about trauma. So beautiful and insightful. Thank you, Mary. I’ll keep them coming 🙂 It’s always good to hear what works well. Many, many thanks from another fan of your imaginative, revealing and often poignant art work, Wendy. I find it amazing that you can (or could back then) tune in to your inner self so strongly and with such focus. And I am again so glad that you can now explore and integrate what your mind could not yet grasp in those troubled earlier years. It is wonderful how as we grow older we can each discover more of the truth and find healing, self-acceptance and peace..